Unavoidable on the pitch, elusive off it. 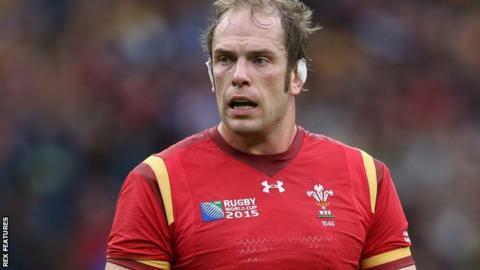 Despite the unrelenting scrutiny of what head coach Warren Gatland calls Welsh rugby's "goldfish bowl", Alun Wyn Jones remains an enigma. He has made 100 Test appearances - 94 for Wales, six for the British and Irish Lions - but the lock is a phlegmatic character unmoved by milestones. The Ospreys captain's achievements already include two Grand Slams, a Six Nations championship, three Pro12 titles, an Anglo-Welsh Cup and the honour of leading the 2013 Lions in their series winner in Australia. Jones will edge closer to a Welsh century of appearances when he faces Ireland in Sunday's Six Nations opener. But true to form, the 30-year-old is reserved about his next looming landmark. "I'm not very good at looking too far ahead," Jones told BBC Sport. "People always think 'he's being dour' or 'he's putting himself down' but I'm just realistic. "Form, fitness - these things are not in the forefront of your mind, but they've got to be at the back of your mind. "It's not being negative or being too careful - it's just a fact of the game." Wales' last visit to Dublin saw them grind out an impressive World Cup warm-up win in August. The match paled into insignificance for the locals, however, as they bade farewell to former captain Paul O'Connell making his final appearance in Dublin. It was an emotional occasion for the ex-Munsterman, while another typically industrious Jones display went almost unnoticed. The Ospreys skipper is not one to praise himself, but his long-time second-row partner for Wales, Luke Charteris, is happy to oblige. "You talk about the best second rows in the world, you mention Paul O'Connell and you mention Al with him," says the Racing 92 lock. "I'm lucky enough to play with him a lot and he's a quality player, in what he does in terms of his leadership and the way he plays." It is not only Jones' contemporaries who hold him in such high regard. Legendary former England captain and second row Bill Beaumont faced some of Wales' greatest teams during the 1970s - but believes Jones is as good as any lock his country has produced. "Well, he's a far better player than I was," Beaumont says with a generous smile. "He's a very bright player and a guy I enjoy watching. You've got to look at history - winning a Lions tour in Australia and two Grand Slams. "Not many compare even in the halcyon days of Geoff Wheel and Allan Martin. They've had some good second rows and he's up there with the best." Jones' reputation is built on a ferocious work ethic and fiercely competitive spirit - among other myriad attributes. His powerful tackling and ball-carrying are the products of a demonic determination, which has made him the subject of some amusing internet memes. But is the image of Jones the enforcer sometimes exaggerated to the point of caricature? Jones' first child, daughter Mali, was born last year and becoming a father has given the Wales player a welcome new perspective on life. "I don't want to be harping on about it like I'm the first rugby player to have a kid," says Jones. "I'm very conscious that I've been in a privileged position to just play rugby, and I feel even more so now I'm able to play rugby and have a family life as well. "Having a child is the best distraction from what can be a very privileged position, but also very intense at times. "That gives me the confidence to be happy and enjoy and make the most of where you are and what I'm doing." Jones' recent displays for Ospreys and Wales certainly suggest he is enjoying his rugby and life in general. With a tour to New Zealand with Wales this summer and a Lions series in the same country a year later, Jones is braced for a busy 18 months. Not that he is contemplating any of that, adding simply: "If you look too far ahead you're going to miss something."